Want a Free E-Book on top workout mistakes and how to fix them? 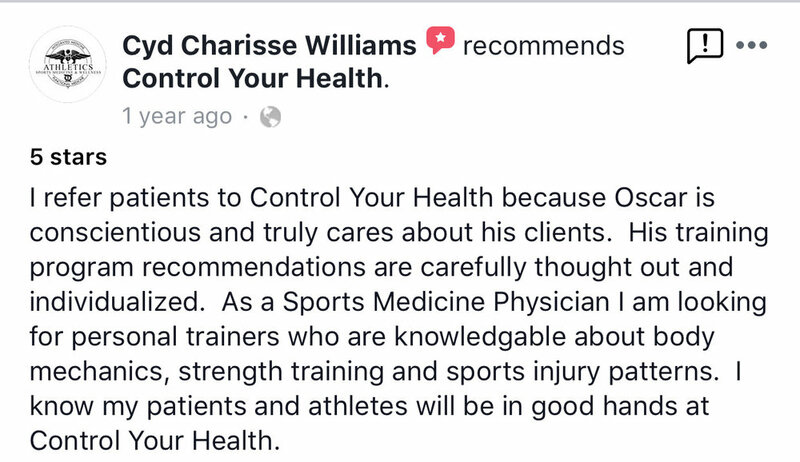 Testimonials: See what our clients are saying about Control Your Health! "After realizing that I was not in the shape I wanted to be, I went looking for a new way of training. I found Oscar at Control Your Health and although I was apprehensive at first, I decided to give it a try and see if it would fit my needs. I have now been going to the classes religiously for 6 months and have achieved great results. As the program is tailored to your own goals, it is much easier to feel the service is being personalized to your specifications. I wasn't 100% sure before, but after reading those testimonials, I really want to learn more about Control Your Health!